Ok my first ukitake jyuushiro wall got deleted so here's my second one. Hopefully this one doesn't get deleted. I actually prefer this one to the first one tho. The leaves are reddish brown because im trying to create an autumn feel. Rare to see Ukitake Jyushiro wallie. I agree that this wallie is nicer than your first one, mainly because of the background ;) Keep up the good work! Wah. A rare Jyuu-chan wallpaper! ^^ It's wonderfully done. Thanks for making it! I think that this scan would be better in front of a structure with some yellow lamps, may be a lake in the background could work, and I am not implying that your wallpaper is a bad one. I dont see much of Ukitake nowadays.Good to have in favs. Yeahey! Der Ukitake @ last! He's soooo hard 2 find u noe! I hope more ppl wil do him! Even Gin or Aizen! 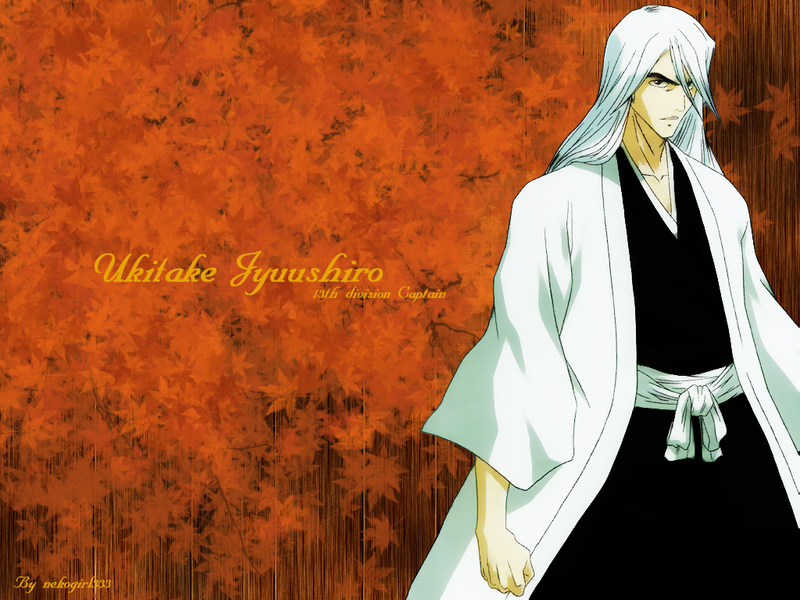 Even Hitsugaya.... (even thought his popular but few gud wallies of him....) Hehehe! Ah... Ukitake. Always a good choice. Nicely done.